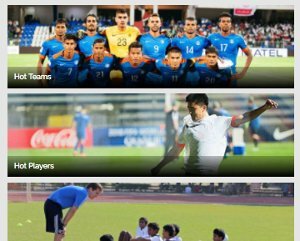 The Highlanders could not capitalize on their chances against the Mumbai side. 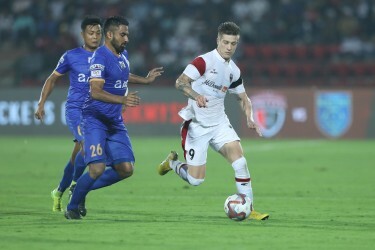 NorthEast United tasted defeat for the first time in the Indian Super League this season after going down to visitors Mumbai City 0-1 in Guwahati on Friday. The Islanders broke the deadlock as early as in the fourth minute, after a controversial refereeing decision went in favour of the visitors. 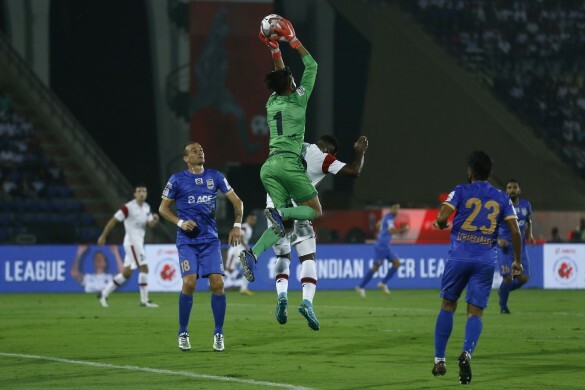 Apart from occasional patches of control over the ball, Mumbai were made to fall back and defend their goal, while NorthEast United had the majority of the possession. As NorthEast United adopted a high pressing strategy, Kumar had very little to do in the first half, apart from the goal conceded very early on and dealing with occasional back-passes and corners. The Manipuri right-back was very impressive in the first half. He was full of energy, sending crosses into the box. He also kept the Islanders' midfield in check from the right corridor. Playing as a holding midfielder, the Indian veteran controlled his gameplay quite intelligently. He made himself available in attack as well as in defence, based on the situation. Took aim at goal a few times, but was unlucky to miss out. Had a shaky beginning in the early minutes. Found his form and helped his side press higher, while also making overlapping runs on the left flank. Was a bit sloppy early in the second half. Taken off in the 64th minute. As usual, the youngster was full of fuel and gave a tough time to the visiting defensive midfielder. Rallied the ball into the opposition half with great vision and pace. Swung in fine crosses into the box. However, ended up on the losing side. Was deservedly named the Best Young Player of the Match. Taken off in the 76th minute. Showed great maturity and versatility in the defensive midfield position, playing alongside Rowllin Borges. They both switched positions with one another quite frequently when the Highlanders tackled certain situations. Came in for Redeem in the 76th minute as a defensive reinforcement. Didn't have much to do as NorthEast United played a pressing game in the final quarter of the match. Came in for Robert on the hour mark. Played in fine crosses into the box finding Juan Mascia on a few occasions. Displayed safe hands, didn’t fumble or show any hesitation. Was the busiest of the two keepers in the match. Earned much praise from all circles, making three saves and six clearances. Amrinder was the reason Mumbai went home with all three points. The Manipuri midfielder made some rash challenges early on in the game, as Mumbai made sure they held on to their lead. He committed as many as three fouls in the first 14 minutes. Milan was taken off in the 65th minute. The left-back put in a full shift of hard work. 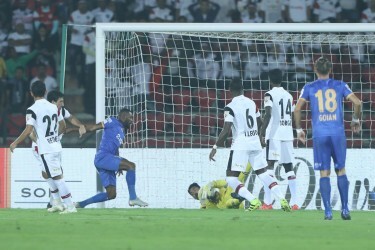 Bose made sure Mumbai maintained a tight defence and kept NorthEast United from having a sniff at goal. 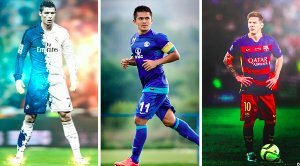 Hard-working, displayed great work-rate and agility. Managed to keep the NorthEast attack at bay throughout the game. He clocked an impressive three tackles and eight clearances. Played a crucial role in the heart of the midfield. Sehnaj made two tackles, three clearances, two interceptions and two blocks and contained the NorthEast midfield. Didn’t see much of the ball, however, made sure the man-marking and defensive alertness were right up to the mark. Great co-ordination with Lucian Goian and the backline. Made three tackles and five clearances in the entire game. Played second fiddle to the centre-back partnership, but made sure Mumbai's defence couldn’t be penetrated. Came on for Milan Singh in the 65th minute. Displayed good composure while passing the ball around. Played it safe and helped his team earn three points. Came in for Issoko Arnold at the end of regulation time. Tried to take the attack to the opposition and rolled the ball forward, killing time.